The boyfriend and I accidentally discovered this place (a week after new year) when we saw that the building behind Ayala Columns already had restaurants open despite being under construction. We ended up going in and exploring what the place had to offer. Ok, I never knew that Koreans could eat so much meat and vegetables. We had two orders of those thinly sliced beef called Woo Samgyup (at around P450 each), thinking, “How heavy can it be?” We didn’t know that the beef came with a TON of veggies, some soup starters and dessert. Let me just give you sample photos of our table. First came the vegetable tray and the side dishes. I felt my stomach go into shock just at the sight of that refillable vegetable tray. More side dishes in the middle of our table. There’s even a salad bowl on the upper right portion. Finally reached the end of our table. Truth be told, I didn’t think it was possible to fill a table with a veggie buffet so I sorta regretted ordering the extra mushrooms. Then the super helpful waitress (who actually plays DOTA) cooked the beautiful thin slices of beef. 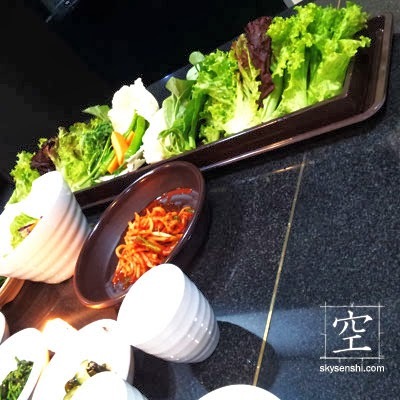 Apparently, the Koreans wrap the beef and small veggies with a huge lettuce leaf. Like so. You’re supposed to make a ball and stuff that thing — THE ENTIRETY OF IT — into your mouth. The bigger you can stuff, the luckier (with money) you will get. When you feel like your mouth becomes similar to a chipmunk’s, then you’re doing it right. Dessert is like some kind of iced soup, though it reminds me of sherbet. It has a kick and I actually appreciated how it seems to cleanse my palate better than the usual desserts we eat after a heavy meal. And she said, “It’s because of the veggies.” Thank goodness we were able to walk home because I felt like we should be rolling home like a couple of ticks. Surprisingly enough, I lost weight the next day. Whoa. Because we accidentally found the place, I thought I should post the map at the back of the business card the operations manager gave us. This post reminds me that Korean food is good, but that I don't eat it enough! Is one order of beef good for two already? Hi Kari! The minimum order for this particular beef is two. It will be enough for a Filipino group of four (but not for a Korean group of two). Oooh, ginger! It's super healthy then! Medyo hole-in-the-wall siya malapit sa Kalayaan. Sige, will look for it sometime. Haha!